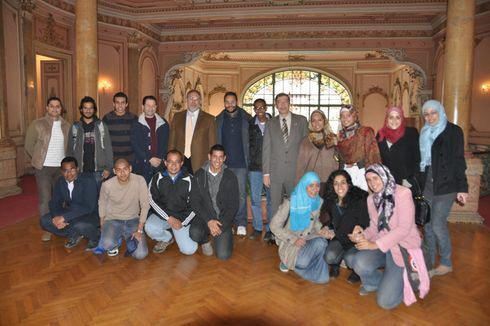 A group of students from Ain Shams University Cairo will travel to Berlin and Hamburg between 10th and 19th February 2012. Aim of this trip which is coordinated by WANACU is a workshop dealing with the broad topic of student participation in university politics. This activity is financed by the German Academic Exchange Service (DAAD) under the title &quot;Student Participation as an Element of Democratic Universities&quot;. 18 students (plus one coordinating Assoc Prof. from Ain Shams University) will join the trip which includes 6 days in Berlin and 3 days in Hamburg, organized by HafenCity University. The students (predominantly bachelor students) have mixed backgrounds and gender, but they are all engaged and interested in university politics at their home university in Egypt and wish to learn about how the topic is dealt with in Germany. Cultural program (incl. Egyptian Embassy, Berlin film festival, movie night, city tour, cooking together, etc.). Another group of Egyptian students from Cairo University will be in Berlin in for the same period. This group will be supervised by Freie Universität Berlin. For some activities, both groups will meet each other.